Do as you have been told. It’s for your own good. Dr. James told me “I’m the head of the family, you know.” I shrugged it off but I believe what he meant was – you do as I tell you. Inspector Clarke R. said to me during our “tea”, paraphrasing, “James is the head of the family we all do what he says”. Well my experience with the head of my family was he could not be trusted. So that remark, by a step-brother who was never there for me, didn’t mean a whole hell of a lot except to put me on my guard. 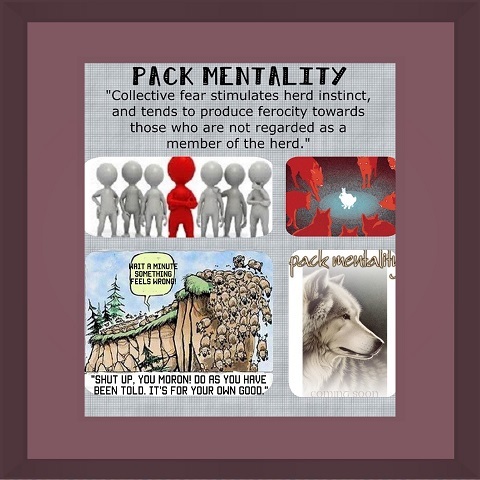 Pack mentality is never good. It makes people behave in ways that are wicked; over time – they become evil. Look at all the atrocities in the world carried out by evil figureheads that led followers to act in ways they didn’t want. For example, King Herod had his men killed all the baby boys and small children in the land. Not all of those soldiers would have wanted to commit such crimes, but they did. They became evil because their deeds were evil. Carrying out such vicious acts had become their new normal. The evil in cultures is what I find most frightening. Individuals scared of their own family members because of what these people are capable of. It is even worse when you have an entire set of adults that all believe they are good people, say for example Church goers that go to Church regularly, and pray to God regularly, but their actions are not at all Godly; actions that do not reflect the one they serve. Not all of them are religious extremists, some of them might be – but most of them are just people who go along with the pack – herd mentality carries them along. They can be quick to tell young people that they must respect their elders, but their own personal behavior is of a manner that deserves no respect. I knew this elderly woman who couldn’t cope with the idea that I am different to other girls she knew, girls that were perhaps ‘chatty’ with her, very friendly. Well, I’m a pervasive development girl – I’m independent and live within my own bubble, not to offend anyone but because I was born that way. This elderly woman was cruel to me often, talking down to me and making unkind comments. She viewed me as rude because I wasn’t talkative and didn’t always speak when she spoke to me. The thing is, I spoke to her within my head and was too young to understand that responding inside my head meant that I should respond out loud. I therefore, without meaning to – solicited frustration and anger from this woman; who had clearly decided I was a disrespectful little girl. I saw what appeared to be her hate for me growing. I also saw how she’d pretend to be nice to me when other adults were around – but then return to talking to me like I was nothing the moment I was alone with her. This woman fooled the other adults because she called herself a Christian and if she heard about a crisis she’d run up to her room to pray. Therefore she was known to my community as a God-fearing woman. I saw a different side to her – her ugly side. However, I heard that it wasn’t just me this happened to. The problem ism people like this woman are protected by herd mentality because if in the presence of others (in her community) say, she tells you that you have done something wrong – all of the other adults will come down on you like a ton of bricks – immediately accepting she is right because she is your elder and you must respect her. You must accept you are in the wrong – even if you have done nothing wrong; you must accept she is right, and that is the end to it. An example of protection by herd mentality. And all those so-called Christians – those adults that protect this elderly woman without alerting her to the dangers of living in conflict with her beliefs – they are all living in cognitive dissonance and are guilty of wrong-doing. As a result of this elderly woman I shall never trust her culture and traditions, the very thought of it fills me with a distasteful dread. Since part of that culture I am expected to embrace – this is a great loss to me. Try as I might, I cannot see any good in that culture. I’m working on it but for now those cuts still run deep. Hi, I want to get back to you and comment, rushing right now. if its ok with you I will get back to you later. Indeed. It might have been the deciding factor in their actions. Albeit doesn’t change my position.